What’s on your lawn? Who’s getting your vote? 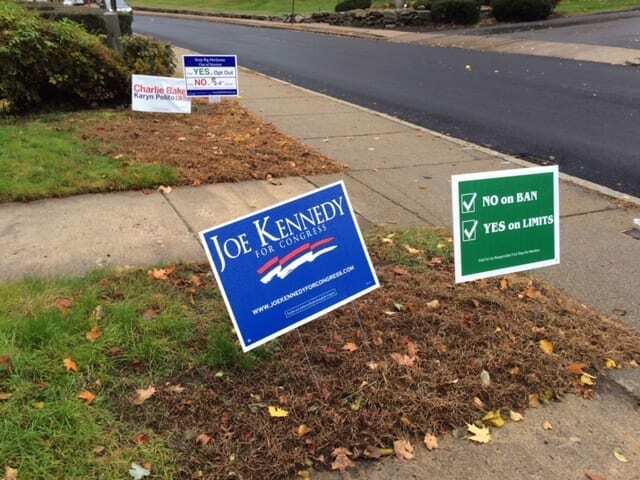 What, if any campaign signs are on your lawn, and why? Or what candidates or ballot questions are you most interested in? Make your pitch in comments. Nice try to subliminally get readers to vote for the 2-4 Sham Limit. I wonder if that Joe Kennedy supporter realizes that Kennedy opposes the legalization of skunkweed. Actually Bruce, I’m starting to think that whatever you’re smoking is making you paranoid. The good news for the rest of us it that “skunkweek” is not on the ballot on Tuesday. The local sale of highly regulated, thoroughly tested, legal adult use only cannabis in secure retails shops is. Greg suggested I find a job. Looks like the position of Chief Disinformation Officer at Cypress Tree Management is already taken by him. Was he teasing me? @Greg Just because I’m paranoid, doesn’t people aren’t out to get me! BTW “skunkweek” is not on the ballot. Skunkweed is. In my neighborhood the Opt Out signs seem to be winning by about a 30-0 margin. Of course there are a lot of parents with school age children here and they may not want to see their kids’ play date invitations plummet if they let it be known there are pot brownies in the house! Actually, Bruce, Greg’s comment was accurate. You may not like it, but if you read the ballot, you will see that it is. Regulate cannabis shops, don’t ban them. The black market will thrive and continue selling marijuana that’s laced with who knows what as well as other highly addictive drugs. The only substance that will be banned is regulated, tested, labeled cannabis (marijuana) for adults. The OON supporters are getting downright nasty. I can’t wait until Wednesday so we can all move on. There’s nothing on my lawn because I don’t want more plastic in the landfill the day after the election. I’m very interested in Newton’s pot shop debate. I will be voting no on ban, yes on limits. Not because I support limits, but because I think both proposals will pass and fear that the ban might get more “yes” votes than the limits. Other than that: Warren, Kennedy, no-yes-yes on MA questions. Still undecided about governor. Newtoner, we are voting twinsies. I’m voting the same as you (and for the same reason re: pot) except I am voting for Gonzalez. Although I wish I was voting for Warren or Massie. I don’t really think you can draw any conclusions on the marijuana issue based upon lawn signs. It’s clear than those in favor of the ban are passionate and follows they would have lawn signs. But the number of Opt Out signs is still relatively small. And then there are those who could care either way. No signs on our property, but that’s because our road barely gets any traffic. We have people on both sides of the retail dispensary debate in our neighborhood, and we’ve had an unspoken armistice on this issue. Gonzalas & Palfrey: It was clear from the start that the Globe would be for Baker. Scant coverage of the grossly underfunded Democratic gubernatorial campaign made this bias crystal clear. Too bad because these guys had some interesting and visionary proposals that never got traction. Deb Goldberg and Maura Healy: No contest. No doubt. Bill Galvin: The primary election results should have destroyed the myth that Galvin is an out of touch political hack. It never surfaced during the campaign, but it is well known that secretaries of state from many other states constantly seek him out for advice and guidance because of his knowledge and the honesty and transparency of our electoral and campaign system. And I certainly want Galvin on our side when the Republicans try to undermine the 2020 census. He”s onto every trick they use to depress counting in areas with high rates of minority residents. YES on Question 1. I’ve been actively helping the Massachusetts Nurses Association (MNA) with organizing and telephone banks. I telephoned last night and expect to do so today. The union nurses are some of the finest and most committed people I’ve ever worked with in a political campaign. They are a joy to know and work with. I’m beginning to sense that the NO side may be overplaying its hand because more than a few said they were getting turned off to the constant fear based negativity coming from the NO side. My only response is “can you possibly imagine that any nurse you know, whether they are for or against this, would abandon patients during a terrorist attack or be for something that would cause the kinds of dislocations the NO proponents claim will happen if Question 1 is approved”. I certainly don’t and I find that the recipients of my calls don’t either. Question 2: A definite Yes. Marijuana in Newton. No to opting out.